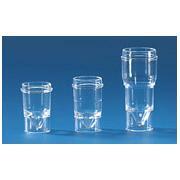 BRAND sample cups are made from virgin polystyrene and are designed to fit many common analyzers. Caps and lids are made of polyethylene for a snug fit. Cups and caps meet CE-IVD Directive 98/79 (except 722060).